Forget What Did: Liminal advertising. I really like old adverts, the sort that tell you to buy Higginson's Coal Wax, because your coal needs waxing, and Higginson's coal wax is the best coal wax with which to wax your coal, so just buy some, ok? These ads often contain cartoon men frowning at their dirty, unwaxed coal; and then beaming at their shiny, waxed coal, twinkling with that unmistakable Higginson's gleam. 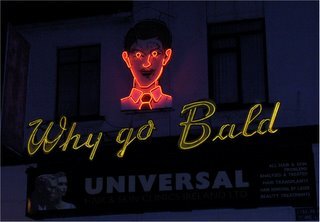 I didn't think you could find adverts like that around any more, but this week Marianne and I were in Dublin, and came upon the following masterpiece in neon. It's an exciting tale in three parts. 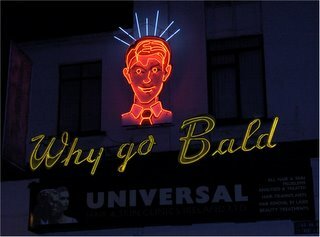 Questions of baldness and hairiness have no meaning for me, for I have no top to my head. Nor do I have a mouth. Possibly these conditions are related, possibly not. Either way, going bald is the least of my problems. That's better, I have a mouth... but it's a mouth set into a vexed pout of disappointment, because, would you believe it, I've gone bald! In fact, it would appear I've polished the top of my head so hard my skull's showing through. Botheration! Hooray! Those good people at Universal have fitted me with a wig cleverly matched to be as red as my face, and I'm cheerful again! Especially as my wig is giving off rays of illumination, like the sun. That's got to be a good thing. Or possibly it's just fitted with seven spikes to stop pigeons landing on it. Either way, I'm on top of the world... and it's all thanks to Universal! 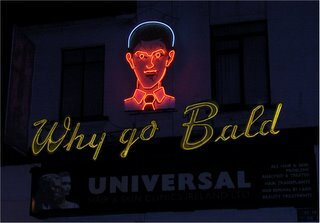 Why don't YOU go and buy a wig now, Baldie?